I Need a Prepaid Card. What Are my Best Options? First, it’s important to understand that prepaid cards and debit cards are two different types of cards and function differently. According to the Consumer Financial Protection Bureau (CFPB), debit cards are tied to a checking account, whereas prepaid cards are using money you load onto the card in advance. There has been a surge in popularity of these cards in the last decade. In fact, the St. Louis Fed reported that these cards are the fastest growing form of non-cash payments in the United States. Prepaid cards can be loaded online, via deposit or even at physical locations and then used like a debit card without requiring a bank account. Many companies, like Visa and American Express, offer prepaid cards. Some of the cards can come with modern banking features like online account management and bill pay, as well as direct deposit and mobile check capture. These cards can be a useful option for people with no bank account who still want to carry plastic to help them manage their finances. Even if you have a bank account, prepaid cards can help you stay on a strict budget or give you the opportunity to provide funds to family members. It’s easy to get a card online or in participating retail locations. While they typically don’t require credit checks, they do come with their own unique set of fees and restrictions. If you’re considering getting one, it’s important you do your research and find the one that works best for your budget. To start, here are a few of the best prepaid debit cards available today. Why We Picked It: American Express Serve (is fairly inexpensive and has many features that commonly come with having a bank account. By using direct deposit and visiting the right ATMs, you could conceivably use the card for free. Card Details: You can load this card via direct deposit, bank transfer, a check deposit app and even in person at over 45,000 merchant locations including CVS, Rite Aid and Wal-Mart. The American Express Serve card features free online bill pay and free ATM withdrawals at over 24,000 MoneyPass ATM locations. Fees: There is a $1 monthly service charge that is waived if you direct deposit $500 or more to the card each month. Reloading cash at retailers can cost you up to $3.95 for each transaction, but adding funds via direct deposit or bank transfer is free. Using the app, check deposits are free but can take 10 days to clear. If you need your check deposit right away, you’ll pay a 1% fee on payroll or government checks with preprinted signatures and a 5% fee on other checks with a $5 minimum. And if you go to a non-participating ATM, you’ll be hit with a $2.50 transaction fee. Why We Picked It: Launched in 2012, the Kaiku Visa Prepaid Card is a low-cost option with straightforward fees and modern features. 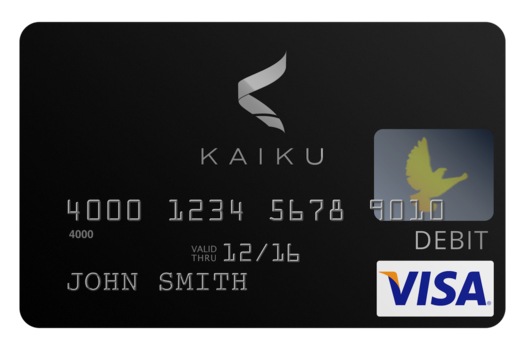 Card Details: The Kaiku card can be loaded via direct deposit, PayPal and Amazon transfers and at ReadyLink or MoneyGram locations nationwide. You can deposit checks via iOS and Android devices. You can also make one time or recurring bill payments, send money to other Kaiku cardholders and get cash at over 55,000 surcharge-free ATMs. You can even choose from one of six stylish card designs. Fees: Kaiku’s monthly fee is $3, which is waived if you load at least $750 onto the card each month. Non-network ATMs have a $3 transaction fee, and fees for loading cash loading at merchants range from $2.95 to $4.95. Expedited mobile deposits incur a 1%, 4% or $5 minimum fee depending on check type. All other features come free. There are no overdraft fees. Why We Picked It: The Bluebird card works similarly to a checking account and comes with minimal fees, making it a good option for customers without a bank account. Card Details: Bluebird can be loaded for free using direct deposit, debit card transfers, mobile check deposits and on location at Wal-Mart. The card is great for disbursing family expenses, as Bluebird customers can give four cards to anyone they choose and then set spending and ATM limits. The card even has SetAside Accounts, its own version of a savings account. A mobile app, purchase and fraud protection benefits and even paper checks come with the package. Free ATM access is available at over 24,000 MoneyPass ATMs. Customers can even pick up cash at Wal-Mart using Cash Pickup Powered by Ria. Fees: There is no monthly fee for Bluebird. Near-instant access to check deposits will cost 1-5% of the check amount, at a minimum of $5. ATM transactions at non participating ATMs cost $2.50. Cash Pickup Powered by Ria costs $3, $6 or $9 depending on the amount of cash withdrawn. Other than that, all standard benefits are free, potentially making this the cheapest option on our list. If you’re looking for a preloaded card separate from a bank account but also want to build or improve your credit, you may wish to consider a secured credit card as an alternative. Secured credit cards are opened with a security deposit and tied to real money, but otherwise act like standard credit cards. Here’s one of our favorites. At publishing time, the American Express Serve card is offered through Credit.com product pages, and Credit.com is compensated if our users apply and ultimately sign up for this card. However, this relationship does not result in any preferential editorial treatment.